Liverpool striker Roberto Firmino bagged their second against Tottenham early in the second half, but Sadio Mane played a huge role in setting it up. The Reds were worthy of their lead in the first half as they enjoyed the more dangerous moments in the game before Georginio Wijnaldum gave them the lead late on. They didn’t take long to double their advantage after the break, with Firmino tapping home from close range after Mane had got himself free down the left flank with his pace and movement. 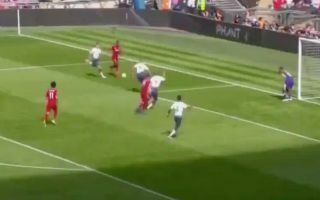 The Senegal international delivered a great ball across the face of the goal to almost force a Tottenham own goal, but Firmino was on hand to make the most of the rebound and put Liverpool in a commanding position. Jurgen Klopp’s side have won all four of their games in the Premier League so far this season, but picking up a win away at Tottenham would certainly rank as one of their best wins to date. Firmino and Mane certainly did their part to ensure that happens.
? MOMENT TO FORGET ?